OPENING in June at London’s Lawrence Alkin Gallery is the first UK solo show by artist Jeff Gillette. Hailed as the artist that inspired Dismaland, Gillette’s work may be familiar since Banksy brought it to the British public’s attention last year. While Gillette’s work was included as part of the first-of-its-kind bemusement park, the installations all shared a common theme that echoed the artist’s signature subversion of Disney and its characters. Featuring 15 paintings, Gillette’s latest body of work is a continuation of the post-apocalyptic scenes he’s been creating for over 20 years. This time, however, Gillette turns the tables on Banksy, with many scenes in his new work inspired by Dismaland. Dismaland Calais is based on Banksy’s digital realization of the Dismaland Castle, reimagined within the Calais refugee camp. In the painting Gillette adds his own surprises, Dismaland detritus scattered about amongst the ramshackle tents, tear gas canisters rolling in the background, and the occasional Dismaland employee wandering in the ‘jungle camp’. The castle’s entryway is emblazoned with the initial ‘B’ instead of ‘D’ and is surrounded by an infestation of Banksy’s ‘Minnie-Rats’. The 36x48” acrylic and collage piece by Gillette surrounds the castle with tents and shacks synonymous with the artist’s slum paintings. 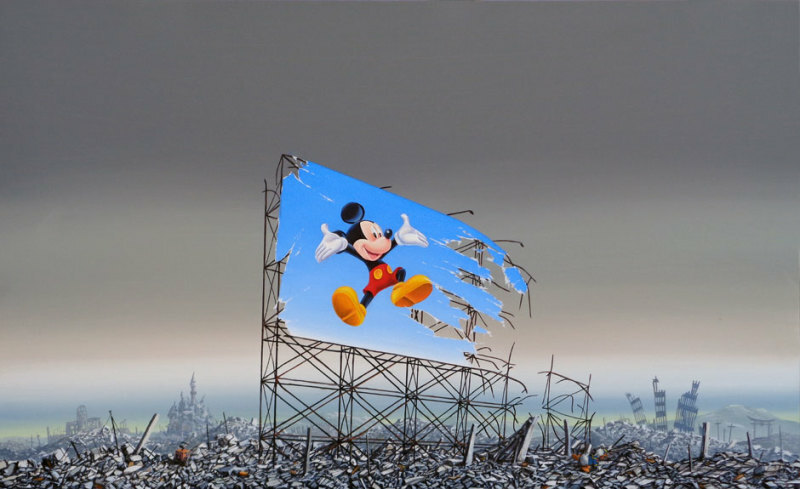 Other works show a huge landfill with a broken down London Eye, London in need of ‘Dismal-Aid’, Mickey Mouse living in a slum and Minnie Mouse on a billboard hovering over a post-nuclear Hiroshima wasteland. Gillette’s long-standing favour of juxtaposing Disney images with slums and scenes of despair and ruin came during a period of soul searching. “In my late twenties I ended up joining the Peace Corps in Nepal. I was there for two years in an isolated environment where I had too much time to read heavy books and think. Many of the ‘slumscape’ paintings in Post Dismal are a product of Jeff visiting his favourite destination, Mumbai India. There the insurmountable gap between the rich and the poor is the most prominent of anywhere in the world. In the piece ‘Transition’, Jeff highlights the absurdity of this situation in today’s world by juxtaposing a Dismaland worker relieving himself onto priceless works of art. A Pollock painting and Rauschenberg’s ‘Monogram’ are pictured as building materials on the roofs of the shanties in Dharavi, India’s largest slum. Jeff Gillette's paintings examine the aesthetic structures and visual patterns of human settlement, specifically that of shantytown style slums in India and South America. To the artist, there is something ineffable behind the obviously chaotic and desperate appearance of these places — a universality of human spirit and a strange beauty that comes out of the necessity and raw honesty of the will to survive.